Be inspired by the huge variety of evergreen bamboo plants for sale to suit any garden, landscaping project, patio, or balcony. 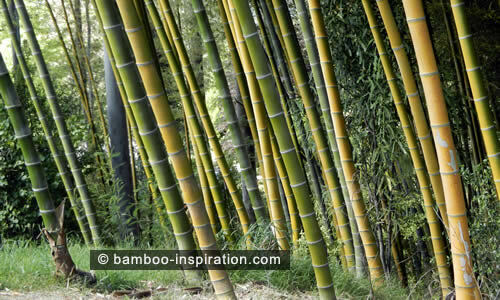 Choosing, buying, planting, growing, and caring for bamboos. 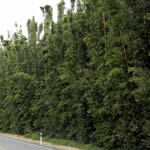 Bamboo grows in a multitude of sizes, from the smallest dwarf species to those giant bamboo forests. 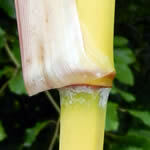 The culms are different heights and colours, the leaves are various sizes and range from plain to variegated, some have a multiple branches and others have few, some species arch over whereas others shoot straight and upright. There is absolutely a bamboo plant to suit everyone and your winter garden will be much improved with the evergreen foliage and colourful canes. Hardy bamboo plants are very popular for; evergreen bamboo privacy screens or hedging for seclusion from neighbours or to absorb unwanted noise, and as a windbreak for protection from harsh weather. 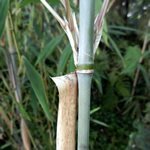 Choose from medium to tall bamboo with various branching habits and leaf sizes depending on how dense you want a screen or hedge, if you want branching at the top or lower down, and how much maintenance you will be able to do. Hardy container bamboo gives you options for small gardens and patios, moving the pots around to hide or decorate fencing, provide privacy, or as ornamental plants. Various species are more suited to containers than others, choose compact growing bamboos for pots, small or tall, and many have coloured canes. 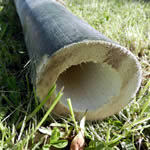 Inspiration for your garden, or buy bamboo and have them delivered to your door! 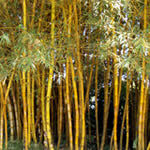 Use bamboo for fencing or to make a neat edging along borders, and fountains and structures for a tropical type design. They can be left un-pruned, but like many other plants, pruning is sometimes necessary to maintain the plant and to control invasive species. 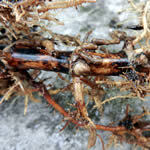 Control and Containment... guide to controlling the running species, lots of tips, including root barrier and installation guide. When you choose your plant it’s important to know its growing habits so you can determine if it is suitable for the purpose. There are lots of clumping bamboos to choose from and no need for you to worry about them getting out of control. However, you may be looking for a plant that will spread aggressively within a pre-determined area, and not through to the neighbour’s garden. 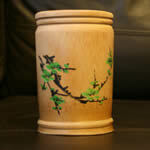 Ideas for bamboo gifts for; Christmas, presents, birthdays and special occasions. I always think a good book can't fail to be a good choice for a gift and the topics you can choose from range from those related to bamboo plants and gardening, to books about traditional crafts. Plants make great gifts but there are also so many other beautiful hand crafted gift products made out of natural bamboo. Because bamboo is quick to mature hundreds of different types of products can be manufactured from harvesting bamboo. For example: clothes, bedding, kitchen utensils, furniture, and lots more. The construction industry also makes use of the wide variety of bamboo building products now available that are made from this most versatile and sustainable material.